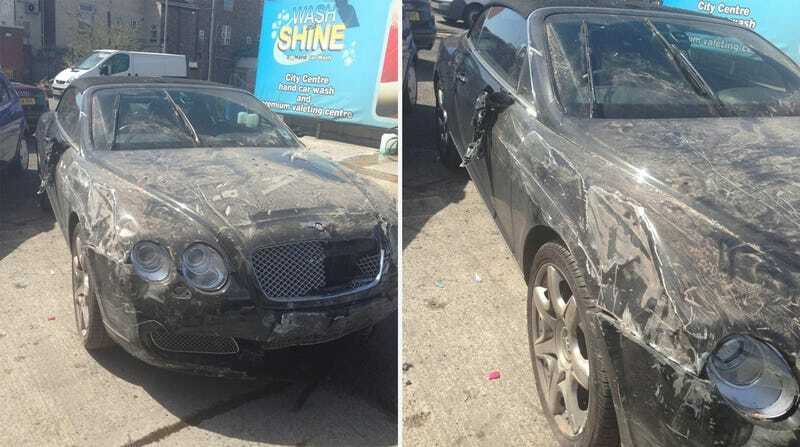 Jessica Sawyer thought she was taking her £80,000 Bentley GTC for a car wash in Manchester, UK, but fifty minutes after she dropped off her convertible, she got a call from the police saying it had been driven through a brick wall. How did it happen? The Daily Mirror reports that when she pulled up to the car wash, Jessica handed her keys to a car wash attendant. It turns out, the person she handed her keys to didn't work for the car wash at all. The would-be thief made off with the Bentley and promptly crashed it, purposefully or otherwise, I do not know. Her insurance will reportedly cover the £48,000 ($73,800) of damage to the car, the car wash denies responsibility as the thief didn't actually work for them, and Manchester police have declared the case a civil matter. Do not take a Bently GTC to the car wash.